COLUMBUS — The third time was the charm for the Piketon boys 4×800 m relay team on day one of the OHSAA state track meet at Jesse Owens Memorial Stadium. Friday marked the third time that Redstreak seniors Kane Dixon and Seth Farmer had competed in the event at the state level, and the first time the duo made the podium. Dixon and Farmer, along with senior Stefan Thacker and freshman Austin Taylor, finished with a time of 8:13.26. “It was a lot of hard work and a lot of miles (to get to the podium),” Piketon track coach Joel Shepherd said. Taylor, competing in his first state meet, ran the anchor leg for the Redstreaks. Despite suffering from stress fractures for much of the season, Dixon was able to post a split of just over two minutes. In order to stay healthy, he’s trained in the pool and on the bike while only running in meets. “With a healthy version of himself, he’s one of the best in the state,” Shepherd said. Piketon sophomore Timothy Trawick joined his teammates on the podium by placing fourth in the high jump. He improved upon his 11th place state meet finish from a year ago by jumping 6-06 on Friday. Despite the impressive finish, Trawick had a bit of an off day. “I should have gotten second,” he said. Trawick was hoping to match or top his personal best of 6-08, but couldn’t get over the bar at 6-7. He hopes to continue to improve for next season, and reach his goal of a 7-0. Three of the top four placers came from the southeast district. Coal Grove’s Brandon Adkins finished first with a jump of 6-08, and Adena’s Brian Hall finished second with a jump of 6-06. “It was good training and preparation to have two of the best jumpers in the state around to compete with,” Shepherd said. Wheelersburg’s Ellie Ruby is set to have a busy Saturday. 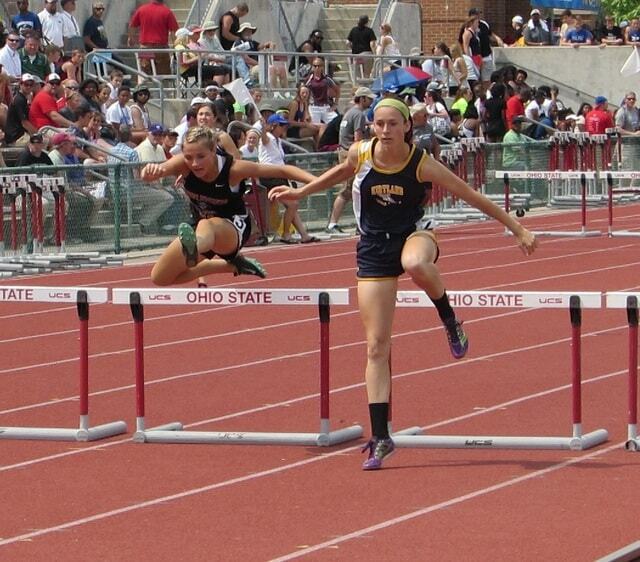 She qualified for the finals in both the 100m hurdles and the 300m hurdles, running times of 14.75 and 45.96. As a freshman racing in her first state meet, Ruby was feeling the nerves while sitting in the blocks for the 100m hurdles. But, she got over them quickly. “After I got over the first hurdle, I thought, ‘Yeah, I’m ready. Let’s do this,’” she said. She finished second in her heat, earning an automatic qualifier to the finals tomorrow afternoon. Her time was also a personal record and reset Wheelersburg’s school record. Portsmouth freshman Lynsey Shipley will also run for the podium on Saturday. Her time of 58.97 in the 400m was good enough to qualify for a spot in the finals. The 400 was one of three events in which Shipley competed on Friday. She also ran the 200m and the 100m, though she did not qualify for the finals in either event. When asked to describe her first experience at the state meet, she said she felt a little overwhelmed. But, all in all, she was pleased with her performance. “It’s a privilege to be here,” she said. Though he was slated to run both the 100m and 200m, Portsmouth’s Darrion Robinson did not race in either event. Trojan boys track coach Chuck Burke said that Robinson was suffering from an injury. In just her first year of competition, Northwest sophomore Shae Patty placed 13th in the state by jumping a height of 5-0. She just missed tying her personal best at 5-2. “Hopefully she’ll be back next year,” Northwest girls track coach Chris Enz said. Though she didn’t make the podium, Patty was pleased with her effort in her first appearance at the state meet. “It was kind of overwhelming, but I’m glad I made it this far and I’m proud of my performance,” she said. Clyde’s Paula Wolllenslegel took home the gold in the the Division II girls’ high jump with a mark of 5-07. Minford senior Grant Piguet didn’t have his best stuff on Friday. The long-jumper faulted on his first two attempts, and his third jump of 17-06.25 earned him a 16th place finish. “I think his jumps that were fouls were good, it just shows you why half an inch matters,” Minford track coach Jesse Ruby said. Though Piguet didn’t reach his goal of making it past the preliminaries, his long-time track coach couldn’t be prouder. Minford still has a chance to get on the podium, as high jumper Mason Harris will compete tomorrow morning. Waverly junior Aaron Elliott came within inches of reaching the podium. His long throw of 54-06 was just centimeters short of eighth-place finisher, Hubbard’s Matt Jones. Waverly boys track coach Byron Green was thrilled with his throwers’ perfromance, despite the fact that a late arrival forced Elliott to use a borrowed ball. “We’re excited, he’s got another year and 14 out of the 16 were seniors,” he said. Notre Dame’s Evan Coriell’s season came to an end in the Division III discus semifinals, after his longest throw travel 122 feet. Though it didn’t end the way he wanted, Friday capped a fantastic throwing career for the Titan senior. Luckily, there is much more throwing to come in Coriell’s future, as he’ll compete for the Otterbein track team next season.